Even the excessively devoted MSM has a whispering campaign going on ever since Hillary had her own 9/11 experience on Sunday. Yes, she actually fell down like the Twin Towers and was only saved from a much more severe accident by a swarm of medical personnel and secret service agents. 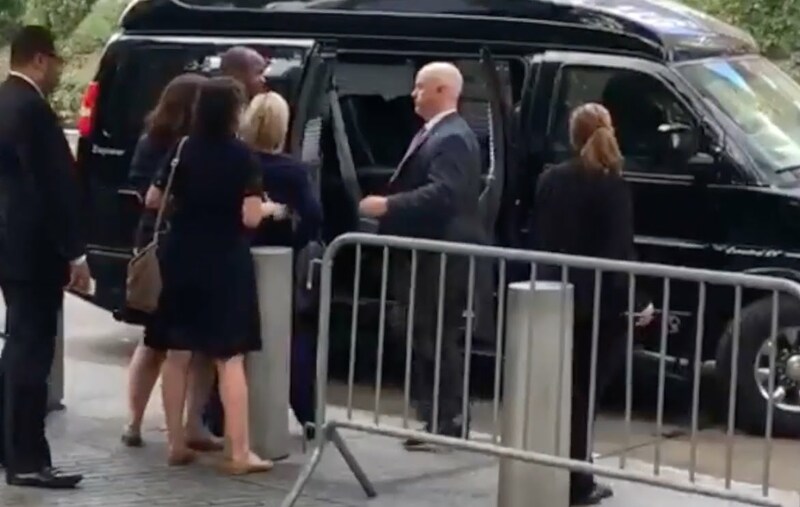 Make no mistake about it, this whole affair was choreographed right down to the angles of the videos which captured Hillary’s now famous Parkinson’s collapse at the curbside. Also know as a Parkinson’s freeze or blackout, such an episode can literally come out of nowhere and without any warning to the caretakers. The problem for a presidential candidate like Hillary Clinton is that such a dramatic display of feebleness and incapacity does not inspire confidence, especially in a prospective POTUS and Commander-in-Chief. Everyone knows the old adage that says when you hear something 3 times, there just may be some truth to it. Well, here’s the same basic message three times plus two. Undoubtedly, the Democratic Party is under the gun like never before. The real question, however, is: “Who is really holding the gun?” After all, this whole drama was planned out with precision for reasons that will become known in short order. The bottom line here is that Hillary Clinton’s presidential aspirations are now a thing of the past. She will never be POTUS in this lifetime in light of the series of medical emergencies and health crises that she has had in full public view. There are now so many serious episodes of one medical problem after another, of one health challenge after another, that it’s a wonder she ever got this far in the process. It is quite ironic that Hillary Clinton showed up in New York State to become the junior U.S. Senator in 2001—the year of the 9/11 terror attacks. Those U.S. government-sponsored false flag terror attacks occurred on her watch. The legal framework and morass of interdepartmental lack of coordination which made 9/11 possible were created on her husband’s watch. Hence, there does seem to be some very serious poetic, if not karmic justice, to yesterday’s hard fall … … … as well as a very rude awakening for the American people. However, the real 9/11 emergency here concerns whether it was truly Hillary Clinton who mysteriously reappeared on the sidewalk in front of her daughter’s Manhattan apartment. She had just been diagnosed with pneumonia and then came out of the front doorway only to beckon a child to come to her … with pneumonia?! Then there is her whole staff who were exposed to her pneumonia for at least 3 days. Walking around the air-polluted streets of NYC shortly after collapsing from pneumonia simply doesn’t make sense. Truly, there is something VERY wrong with this picture. Is Hillary being represented by a double at official events? Is Hillary Clinton Going To Drop Out Of The Race For The White House?